The municipality of Genç (34,311 inhabitants in 2016, 19,628 in the town of Genç) is located 50 km south-east of Bingöl. 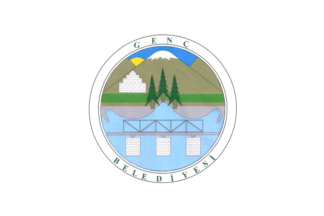 The flag of Genç (photo, photo, photo) is white with the municipality's emblem in the middle. "Belediyesi" means "Municipality". The emblem features the bridge over river Murat, which was built in the 1950s. The suppression of the bridge, announced in 2015 by the Directorate General of Highways, caused a big stir; following a public campaign supported by the municipality of Genç, the project was withdrawn.